It’s now been a couple of years since Google launched the next grade of analytics and dubbed it Universal. The new tool comes with a host of additional functionality that you might find useful when analysing traffic to your website and the way users interact with your site. If you’re currently using Google Analytics, the tech giant now requires all websites to upgrade to the new version. Here at Delacon, we think now is the perfect time to upgrade – not just because you have to but because the additional insights you gain make it highly valuable. The process, which is relatively straight forward, involves several distinct steps and an additional action for Delacon’s call tracking analytics integration. Step 1 – Confirm which version of Analytics you are currently using. Google advises that you need to check both your account property and your tracking code. To find out if your website is using Universal Analytics, sign in to your account and go to the Admin page. Select a property from the dropdown in the Property column. A Classic Google Analytics account has an option in this column called Tracking Code. A Universal Analytics account has an option called Tracking Info that includes more Admin settings like Session Settings and Organic Search Sources. These additional settings are only available to Universal Analytics properties. If you have these settings, you have a Universal Analytics property. On the other hand, if you’re using any other library, like ga.js or dc.js, you’re using a Classic Analytics tracking technology. 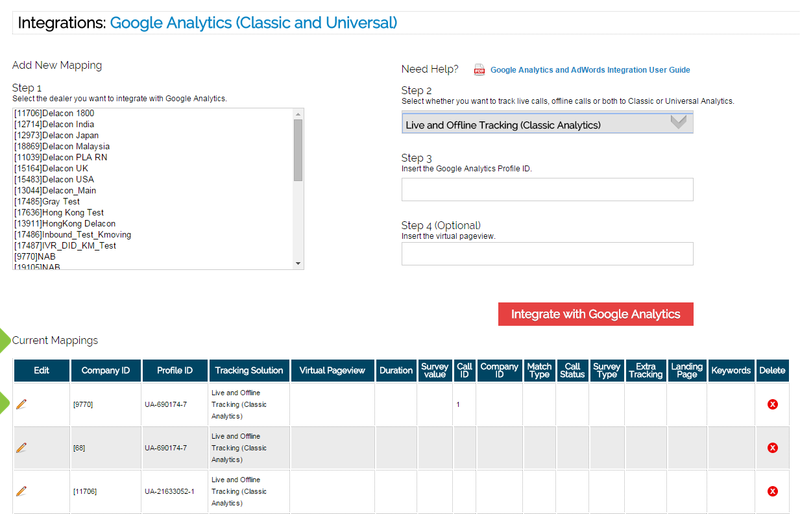 Step 2 – Migrate from Classic Google Analytics to Universal Analytics. Once you’ve determined that you’re currently using Google Analytics, now is a good time to migrate to Universal Analytics. There are two steps involved in the upgrade process – transferring your account and updating the tracking code. To transfer your account, go to the admin page of Analytics and select the account and property you want to upgrade. In the property column, click Universal Analytics Upgrade and in the section called Transfer to Universal Analytics, click Transfer. It’s best to allow up to two days for the transfer to finish. A note will say property transfer complete. The second step that here at Delacon we recommend, is to update your tracking code. You must transfer the property before updating the code – so always wait for the property transfer complete message. Step 3 – Change the Analytics integration in Delacon’s portal. Once the process of upgrading to Universal Analytics is complete – the next step is to integrate Delacon’s call tracking solution with Universal Analytics. This is relatively easy. Step 1 – Login to the portal. Login to Delacon’s portal. Then click on the Integrations tab and click on Google Analytics. Step 2 – Edit the current mapping. To update the Delacon system from Classic to Universal, scroll down to Current Mappings and find the appropriate company (cid) that you would like to edit. Click on the pencil icon to edit that cid. Select whether you want to track Live Tracking (Universal Analytics), Offline Tracking (Universal Analytics) or Live and Offline Tracking (Universal Analytics). Click on submit updates. Your Universal Analytics profile and your Delacon call tracking solution are now mapped. Universal Analytics gives you the ability to send additional data captured by Delacon’s call tracking solution into your Google Analytics profile. Through the Custom Dimensions and Custom Metrics functionality you can now make additional insights into how your callers are behaving. To add Custom Dimensions and Custom Metrics to your Google profile, please refer to Delacon’s data guide.